Establishments with 20-249 employees in certain so-called “high hazard industries” musteach year submit information from their 300A Annual Summaries only. OSHA will publish the data online, likely in a manner that is sortable, searchable, filterable, and as embarrassing to employers as possible. The data will include employees’ personal and health-related information. In theory, OSHA will scrub employee-identifying information (but not employer-identifying information). In a public information session shortly after publishing the new final rule, Assistant Secretary of Labor for OSHA, Dr. David Michaels, stated that OSHA will use software to filter records to drop the column that contains worker identifying information, and the agency is confident there will be “accurate cleaning” of the records. Still, OSHA has acknowledged in public hearings the logistical and resource difficulties for the small agency to set up a system with this kind of huge data processing capacity. Note that the data submission requirements are not corporate-wide. Rather, they are tied to individual “establishments.” OSHA’s Injury and Illness Recordkeeping regulations define establishment (at 1904.46) as “a single physical location where business is conducted or where services or industrial operations are performed.” Accordingly, the new data submission rule requires a location-by-location determination about whether and what to report, based on the number of employees (peak employment at any point during the year, including temporary and part time employees) at each particular location, whether that number meets one of the two threshold levels for reporting (i.e., 20 – 249 or 250+), and for the lower threshold, whether that establishment is in a covered high-hazard industry by NAICS code. During the rulemaking, OSHA considered making the requirement to submit data an enterprise-wide obligation for enterprises with a certain minimum number of establishments. OSHA rejected adopting that alternative in the final rule, however, because it determined that would be too difficult to administer based on differing corporate structures and due to the partial exemptions based on certain NAICS categories. In the final rule, OSHA does permit an enterprise or corporate office to electronically submit data on behalf of multiple establishments if it has control over the relevant recordkeeping documentation, but the obligation for which establishments must be covered and the data itself are still establishment-specific. Historically, the Bureau of Labor Statistics and OSHA both have conducted annual injury surveys in which the agencies direct a set of employers to submit the 300A Annual Summary data. The employers that are required to participate changed every year. the most remarkable data point is the number of detailed incident reports OSHA will receive under the proposed rule – presently, no employer must submit 301 Incident Reports to OSHA (except by request during an active OSHA inspection), but under the new final rule, large employers would have to proactively submit an anticipated approximately 1.3 million 301 Incident Reports to OSHA each year. Negatively impacting insurance coverage and rates. Restate and create a duplicate punitive elements for the already explicit prohibition of retaliating against employees who report work-related injuries found in Section 11(c) of the OSH Act. Establishments with 250 or more employees must submit information from their 2016 300A Annual Summary by July 1, 2017. 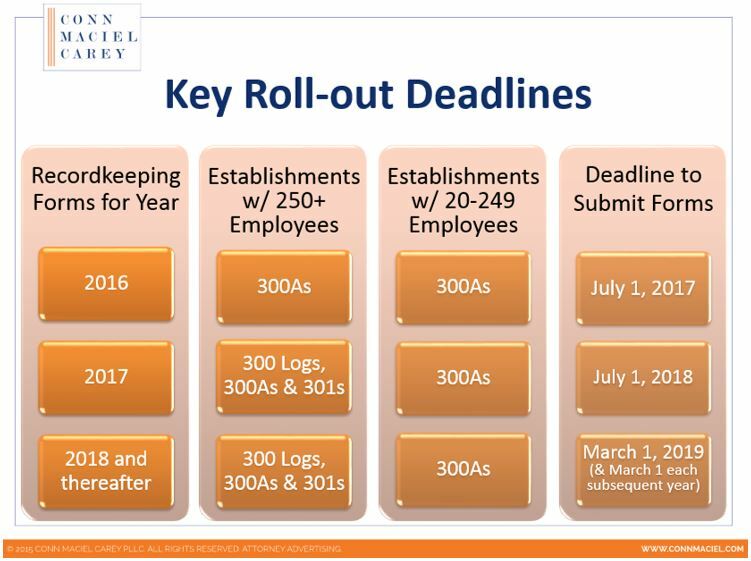 These same employers will be required to submit information from all 2017 forms (300 Logs, 301 incident reports, and 300As) by July 1, 2018, and then beginning in 2019 and every subsequent year, the information must be submitted by March 2nd each year. Covered establishments with 20-249 employees in high-hazard industries must submit information from their 2016 and 2017 Forms 300A by July 1st 2017 and 2018, and beginning in 2019, and every year thereafter, the information must be submitted by March 2nd. Federal OSHA-approved State OSH Programs (e.g., Cal/OSHA) must adopt requirements that are “substantially identical” to the new federal rule within six months after publication (i.e., by mid-November 2016). Some states may choose to allow employers in their states to use the federal OSHA data collection website to meet the new reporting obligations, while other states may provide their own reporting mechanism. Such rosy results are questionable, especially considering the massive resources OSHA will need to actually create and run the database year after year – all the while diverting limited agency funds from legitimate and useful hazard reduction. Significant Burden for No Safety Value. OSHA has estimated that complying with this rule would require very little additional time and expense for employers, because, the Agency reasoned, employers already are required to record injuries on logs and prepare annual summaries and incident reports, and many employers already use electronic recordkeeping systems. Stakeholders who conducted a thoughtful evaluation of the new burdens, reached a very different conclusion. If employers do not currently use an electronic recordkeeping system, they will likely have to adopt some version to efficiently process the data to submit to OSHA. Even if employers already use an electronic system, they will have to modify it or adopt a new version that “interfaces with” OSHA’s reporting website, if that technology will even exist at all. Otherwise, the new rule will require a tremendous amount of manual data entry and/or duplication of previously entered electronic data. More importantly, any amount of burden is too great if there is no value that derives from the data collection. Nowhere in the extensive rulemaking record did OSHA assert that a gap existed in the current data collection regime. The Agency also failed to explain what it intends to do with the additional data, other than to publicly shame employers. Undermines “No-Fault” Recordkeeping Philosophy. OSHA has expressed that collecting and publishing injury-and-illness data will effectively shame employers into eliminating unsafe conditions. From its origins, however, Injury and Illness Recordkeeping was intended to be a no-fault program. Employers and OSHA will have more reliable data if all recordable injuries are chronicled, regardless of cause. Accordingly, the recording criteria do not account at all for cause or fault. An injury is recordable based on the outcome not the cause; simply if it meets the regulatory recording criteria, even if the injury was the result entirely of employee misconduct, defective equipment from a third party manufacturer, another employer’s work activities, or even an act of God. Indeed, OSHA just issued an interpretation letter requiring employers to record an employee’s injury caused by that employee’s on-the-job abuse of drugs and alcohol. Publicizing the data out of context for the purpose of shaming, however, nullifies the no-fault value of recordkeeping, and wrongly presupposes that all workplace injuries are the employers’ fault and/or that employers can prevent all workplace injuries. Likely to Result in Underreporting and Under-recording of Injuries. As discussed above, stakeholders have consistently emphasized that the rule will dramatically increase the risk of employees underreporting injuries and employers under-recording them. If injury data will be shared with OSHA and the public, essentially in real time, there is great risk that employees will hide injuries to avoid having them publicized, and employers will find ways to keep their numbers down. 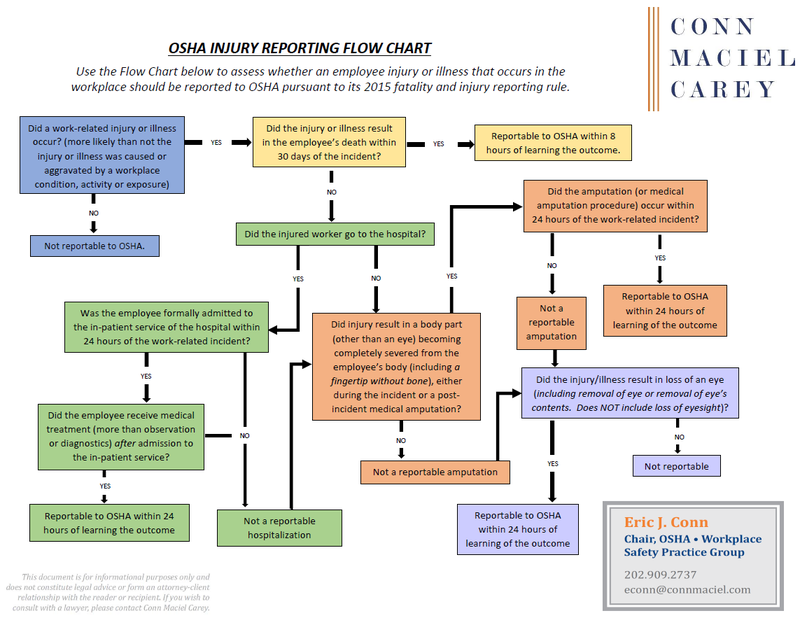 OSHA hopes that employers will achieve that decrease through enhanced safety programs, but some employers will simply not record all recordable injuries, or at the very least, will take a very conservative approach to determining whether an injury meets OSHA’s recordable criteria. Historically, close calls would be recorded because there was value to an employer to seeing the full picture, but now, because of the publicity and risk of intervention by OSHA, those close calls will go the other way. Despite a barrage of criticism from industry stakeholders about the proposed rule, OSHA not only plowed forward to a final rule, but the few meaningful changes OSHA made from the proposed to the final rule move in the wrong direction from the vast majority of comments. The Agency dismissed the business community’s concerns, from the risk of under-reporting to the unfairness of publishing data without context. One key example of OSHA ignoring sensible comments from industry stakeholders is the manner in which OSHA defines the “high-hazard industries” subject to the rule’s new requirements. OSHA rejected Industry’s concerns about how low a threshold OSHA set for what constitutes a “high-hazard industry.” We pushed hard for a change to the proposed rule that would cover a more appropriate set of workplaces, by raising the threshold for “high-hazard industries” from a proposed DART (Days Away, Restrictions and Transfers) rate of 2.0, which is roughly the national average DART rate across all industries, to a threshold DART rate of 3.6, which OSHA has used historically to define high hazard industries in its Site Specific Targeting inspection program. OSHA quickly issued the final rule after the White House Office of Information and Regulatory Affairs (OIRA) completed its review of the final package earlier this Spring. OSHA’s final rule had been under review at OIRA, which serves as gatekeeper for major federal regulations, for almost six months – twice the specified review period, but not atypical for an OSHA rule. Employer advocates are readying likely challenges to the final rule, given the numerous grounds on which it is suspect from a legal standpoint. The challenges are likely to focus on the obviously flawed cost-benefit analysis conducted, the duplicative punitive elements created under the new retaliation components of the rule, and the legal authority OSHA claims to have to publish employers’ injury data online. Parties have 60 days to file challenges in the U.S. Courts of Appeals. Employers must begin to prepare now to comply with the new rule, which will not only trigger increased enforcement, but damage their reputations. This rule is exemplary of OSHA’s determined push to roll out policies and rules aimed not at working with employers in helpful, constructive ways, but instead, using its public platform to “shame” employers over workplace concerns. While Congress could still get involved, the business community’s best hopes now lie in the Courts with the likely legal challenges soon to surface. For more information about the new final rule for injury and illness recordkeeping electronic data submission, as well as OSHA’s other rulemaking efforts on the injury and illness recordkeeping front, join attorneys from Conn Maciel Carey’s national OSHA Practice on June 7, 2016 at 1:00 PM for a complimentary webinar: “Get the Record Straight: OSHA’s Proposed Injury and Illness Recordkeeping Rules.” Click here for more information about the webinar and to register. Thank you for reporting this story. I wonder what the chances are this will be repealed or blocked by a lawsuit? A great review of OSHA’s new rule for any operators with OSHA regulated facilities. Nice job, Eric. It will be interesting to see what happens when OSHA starts citing employers who continue with across-the-board drug testing post-injury pursuant to longstanding policies to that end. Employers now find themselves in a Catch-22, risking OSHA investigations/citations on one hand, or disparate treatment claims on the other resulting from allegedly inconsistent enforcement of the drug testing policies.